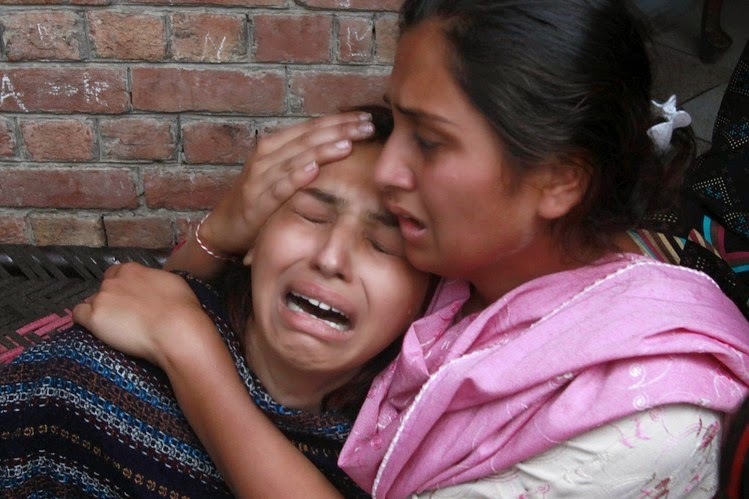 AP-Twin suicide bombings at two churches in the eastern Pakistani city of Lahore killed at least 13 people, including two policemen, wounded more than 65 people on Sunday, and a faction of the Pakistani Taliban claimed responsibility for the bombings. 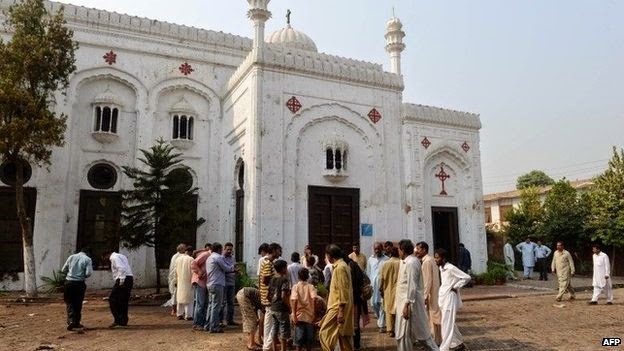 The back-to-back blasts shook the majority Christian neighborhood of Youhanabad as churches in the area held prayer services, police officials said. Emergency-services officials said several of the wounded are in critical condition and the death toll is expected to rise. Police said two suicide bombers detonated explosive vests next to Christ Church and St. John’s Church after security prevented them from entering the compounds, which are a few hundred meters away. Sunday's blasts occurred minutes apart in a majority Christian suburb of the eastern city. Police said it seemed they targeted two churches, one Catholic and one Protestant, that are very close to each other. Ms. Ghazanfar added that around 500 worshipers were inside the churches when the bombers struck. “The death toll would have been much higher had they succeeded in entering,” she said. The attack sparked a protest by members of the Christian community in the area. Footage from the scene aired on local TV showed hundreds gathered outside the churches as rescue workers and police officials tried to clear the way for ambulances. Two unidentified, suspected men were accused of involvement in the attack by a group of protesters and were beaten to death by the crowd, police officials said. Many Christians accuse the government of doing little to protect them, saying politicians are quick to offer condolences after an attack but slow to act to improve security. The protesters blocked the main roads near the church, burning tires and chanting against the government of the Punjab province, of which Lahore is the capital, for not providing adequate security to the community. Local news footage showed dozens of protesters storming a bus station and adjacent ticketing office, and were seen pulling down railings and damaging equipment. "I was sitting at a shop near the church when a blast jolted the area. I rushed towards the spot and saw the security guard scuffle with a man who was trying to enter the church. After failing, he blew himself up," said witness Amir Masih. Haider Ashraf, a senior Lahore police official, said authorities and Christian community leaders were trying to calm protesters. Mr. Ashraf added that protests delayed the arrival of investigators at the scene, and that police are still working on a definitive report on the bombings. Christian communities across Pakistan, including its largest city Karachi and capital Islamabad, organized protests in solidarity with the Youhanabad victims and criticized the government for failing to protect them. “These attacks will continue until there is an Islamic system in Pakistan,” said Ehsanullah Ehsan, spokesman for the faction, which had broken away from the main Pakistani Taliban group last year but rejoined this week. The same faction had claimed responsibility for a suicide bombing at a parade venue outside Lahore at the Wagah border crossing into India last year, an attack that killed dozens.Sunday’s attack was the deadliest on Pakistan’s Christian community since suicide bombers killed more than 70 people at a church in the northwestern city of Peshawar in September 2013. Earlier that year, rioters burned more than 150 Christian homes in the Joseph Colony neighborhood of Lahore. Christians are a small minority in Pakistan, making up less than 2% of the population. They routinely face discrimination and violence by extremists, human rights activists say. The bombings prompted a call from Pope Francis for an end to the persecution of Christians, the Associated Press reported. Addressing the faithful Sunday in St. Peter's Square, Francis said he “implored God, the source of all good, the gift of peace ... for that country, and that this persecution against Christians, that the world tries to hide, ends,” the AP reported. Major attacks against Pakistani Christians are relatively infrequent compared with attacks on other minority groups, such as Shiite Muslims, who are regularly targeted by Islamist extremists. Pope Francis told crowds at St. Peter's Square in the Vatican he felt "great pain" over the bomb attacks, departing from scripted remarks in his customary address on Sunday.